How will I live fearlessly this year? My first answer: I won’t. Fearless – living without fear – sounds like a hero in an epic movie like Braveheart or Gladiator. I’m more like Tom Hanks in Saving Private Ryan. I’d rather yell “get me out of here,” than face awful things. If I can’t be granted that, then I’ll begrudgingly do it. How’s that for inspiration from a life coach? I write about fear a lot. I face fear a lot. A recent blog post took me weeks to publish out of fear…of what the response might be, of how much I exposed about myself. If that is living fearlessly, than that’s what I do. I have a mantra that began years ago while having surgery to remove a benign brain tumor: “I’m Scared & Doing it Anyway.” I believe that you can take fear by the hand and walk through the door. Fear is there. You see it. I see it. Move forward with it. It’s living with fear, rather than without it. Fear is there to keep you safe. Usually the thing you want most is not in the safe, comfortable territory you’re already in. So you and fear need a little chat: Yes, we want that…shiny new whatever. Yes, it’s outside of our comfort zone. Yes, it’s worth it. Let’s do it. • Be my own best friend. I will notice how I treat myself, what I tell myself, and choose better. The more I believe I’m worthy of loving kindness and generosity – and treat myself that way – the more I will receive it. • Date. (I may have just broken out in hives.) I will go on dates this year and meet a great guy. For some reason I’m scared about it right now, which means I need to do it. Gulp. • Challenge what is possible. There is no reason to settle. If I’m “trying to make it work,” whatever it is, it is a sign to find another way. 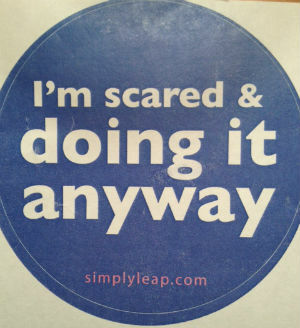 Being scared and doing it anyway, and living fearlessly, all comes down to starting. I will start this year. I will put one foot in front of the other. I will open to a blank page and write. Happy living fearfully to you.